Whether you are selling your home, renting it out, or planning to sell it within the next few years, there are many things you will want to do to make sure you are getting the best price for your home. Your home’s value can easily change. If you never put work into your house, eventually it will lose value. But if you add to it slowly, make improvements, and update outdated items, your home’s value will rise! That seems pretty obvious, but many people do not know how to make these small, but valuable, improvements. There are many ways to add value to your home, and not all of them involve remodeling, which can get pricey. Some of the simplest ways to revamp your home are affordable and can add value. But knowing what to change in your home can be difficult. At JC Toland Painting, we know the value a layer of paint can have. Painting, both indoors and outdoors, can greatly improve the value of your home, improve your curb appeal, and help you enjoy your home even more. In this blog we will go over some of the best ways to improve your home’s value. Keep reading to learn more! Yes, we are going to start with the one thing we are pros at. Painting is a great way to give your home a fresh look. According to DIY Network, painting is one of the most cost-effective and simplest ways to make improvements on your home. Paint, like many other things in your home, becomes outdated and old looking. But adding a fresh coat of paint to the different rooms of your home is a great way to help your house look new and updated. Give your home a fresh coat of paint and be sure to select a paint color that people will like. In a previous blog, we covered the different colors to use for the different rooms of your home. This can help you find the perfect new colors for each room in your home! JC Toland Painting can give your home an even more unique look by adding decorative painting to different rooms. Exterior paint is also important to improving your homes value. Your home’s exterior experiences wear and tear, battling it out against the weather. Eventually your paint will look worn and old, decreasing the curb appeal of your home as well as your home’s value. A fresh coat of exterior paint, that is in style with the current color trends, can do wonders for your home and its value. If you are looking for a quick and easy way to increase your home’s value, look into painting you home. You will be amazed at how easily a paint job can help your home’s value rise. JC Toland Painting can help with all of your painting needs. We can even help remove old wallpaper or stain your deck! Your outdoor space is also important when it comes to your home’s value. Cleaning up your yard, planting new trees, and making the outside of your home presentable can help your home’s value go up. While yardwork is difficult and can be demanding, it is a great way to improve the value of your home and the curb appeal. Revive your grass, remove debris, prune trees and bushes, and get your landscape looking cleaned up and picture perfect. This can help add curb appeal and improve the value of your home. During the winter, some of these things may not be as simple to get done, but making sure your curb appeal is strong during the colder months is important as well. The exterior of your home becomes dreary during the winter, which is why it is important to spruce it up and add some life to your exterior. 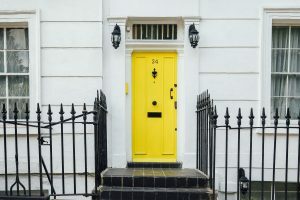 Adding a colorful doormat, using some holiday decor around the entryway, or even painting your front door a fresh new color is a great way to add a pop to your front yard. Cleaning your yard up and adding some liveliness are great ways to improve curb appeal. If you want to increase your home’s value, you have to focus on the exterior as well as the interior of your home. Flooring is another big one. Old and ugly flooring can bring down the value of your home and make it difficult to sell, if you are selling your home. Old carpet is a huge value killer and needs to be swapped out if you want to improve the home’s value. Whether you swap out your old carpet with new carpet or change the flooring type can also affect the value of your home. While many people, especially with kids, enjoy having carpet in their home, it is not the best flooring to choose. New carpet can help your home’s value, but if you are trying to do even more for your home, hardwood flooring is the best choice. Hardwood is one flooring type that will add the most value to your home. High quality hardwood flooring can outlast many other types of flooring, it adds an elegant and warm look to your home, and is durable. New carpet is a great choice, but hardwood flooring is an even better choice when trying to add the most value to your home. Just like anything else, your home experiences wear and tear. Keeping up with your homes maintenance and fixing any issues as they arise can help to add to your home’s value as well. Keeping up with maintenance can help your home stay in good shape and allow you to have an easier time when the time comes to sell you home. Leaky sinks, broken door handles, sticky drawers, and other issues that happen to just about every home should be taken care of right away. Not only will this keep your home in tip-top shape, but it will also help ensure your maintenance issues don’t get progressively worse. Putting these tasks aside to handle later can get out of hand quickly. These issues will add up and pretty soon the maintenance you have to do on your home will take a lot of time and money. As things in your home break or face other issues, be sure to take care of them right away. This is one thing that can help you spend less time in the future fixing bigger problems. Work with your family to fix items throughout your home and stay caught up on the maintenance, improve your home’s value, and save time and money! 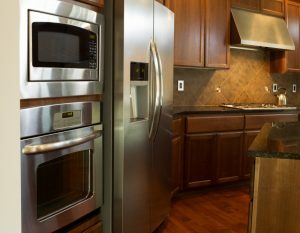 If you have lived in your home for years and have had the same appliances, it may be time to get new ones. Your appliances will eventually quit working as they age, and replacing them before selling your home will increase your home’s value. A new refrigerator, dishwasher, oven, and even your washing machine and dryer can help drastically improve the value of your home. Replace them before your current ones die and enjoy the new and improved appliances for yourself before selling your home. Depending on the appliance they can last anywhere from six to 15 years. According to This Old House, the average age of a refrigerator is about 13 years. If your appliances are about 15 years old, it is time to swap them out for new ones. This will help you get a little more out of your appliances as well as increase the value of your home. These new appliances may also be more energy-efficient, which is also an appealing aspect when people are looking for a home. Everyone is going green nowadays, so upgrading different aspects of your home with energy-efficient products can help your home’s value rise. Add some solar panels to your home, install newer windows that work better, and get a water purifier added to your kitchen sink. These are great ways to make your home more energy-efficient and allow you to increase your home’s value. 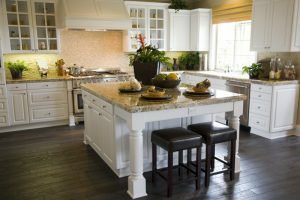 Everyone is looking for these kinds of home improvements, so if you are hoping to sell your home soon and want to increase the value before you do, make some of these changes. Adding more storage to your home can also help the increase the value. Storage is an important aspect in homes and many people look for homes with enough storage for them and their families. If your home does not have the storage you wish it did, change it. 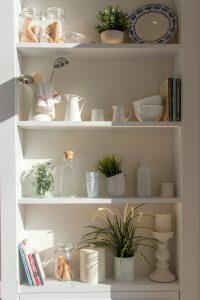 Adding built in shelves, extra closets, and cabinets that are easier to use is a great way to give your home the storage people are looking for. Plus, you can add beautiful and unique shelves to a living room to improve the overall look and create more storage. Add a linen closet, increase the size of your pantry, and add other storage options to your home to give it more value. There are many ways to improve your home’s value, these are only a few! From a simple paint job to small remodels, you can change the value of your home in many ways. Whether you are looking to rent or sell your home or you just want to improve the value for yourself, these tips can help! Plus, if you ever do decide to sell your home, these improvements can help make your home worth more. Start giving your home a makeover and increasing its value, JC Toland Painting can help you make the first improvement! We offer many different painting services that can transform your home from dingy and outdated to styling and new! Contact us today and get a free estimate!